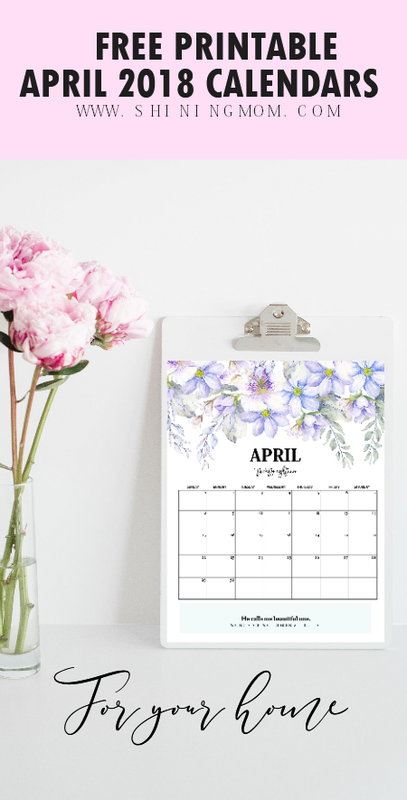 Free Printable April 2018 Calendar: 12 Amazing Designs! Ready to plan your April? 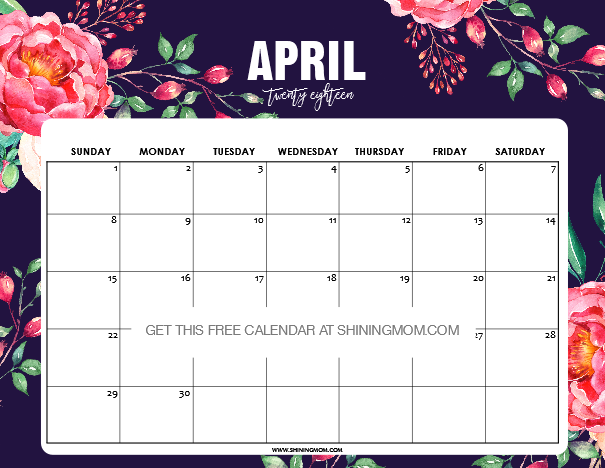 You’ll love the free printable April 2018 calendar planners that I have for you today! They’re great to use for your goal setting and daily planning for the month. Keep scrolling to view the 12 beautiful calendar designs for you to choose from–all for free printing! Please enjoy your free calendar shopping! Hi, friends! Welcome back to Shining Mom! You surely know by now that my free calendar posts are my absolute favorite. Let me guess… it can be your favorite, too! I can see how you flood the blog each start of the month for your free calendars. I think it’s safe for me to say that you’re using the Shining Mom calendar planners to keep you blissful, organized and productive all though the month. Cheers to that! This calendar series of mine has always been the best-loved segment ever! And oh, did you know that it’s now on its 9th year of running? Thank you for sticking along! I am so happy that you look forward to my free calendars each month, all through these years! And if you’re new here, welcome to Shining Mom. Make this place your go-to site for your organizing needs. I am happy that you’ve reached the blog! 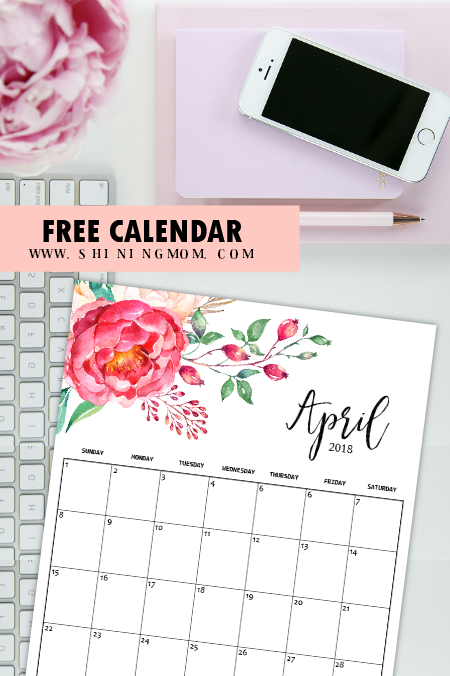 Now going back to the free printable April 2018 calendar planners, you are about to enjoy beautifully designed planners today. 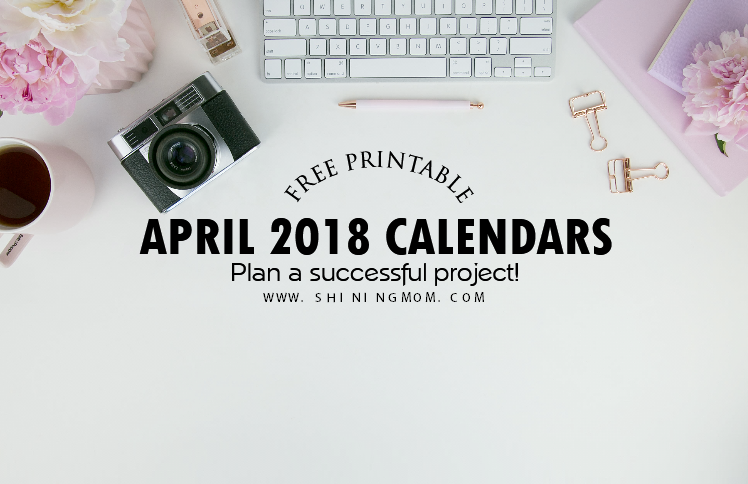 Since I believe that a lot of you would love to have your monthly calendars in advance, I am already rolling out the free printable April 2018 calendar planners as early as now. Ready to snag your free calendars? 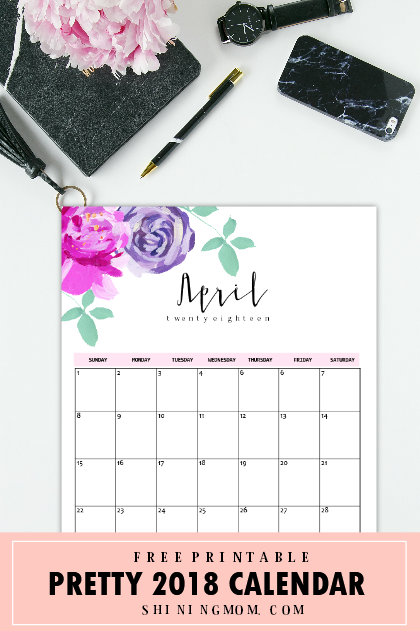 Free Printable April 2018 Calendar Planners: 12 Pretty Designs! 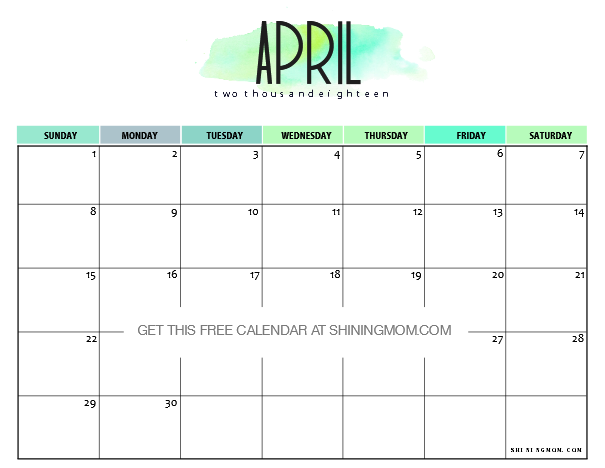 You are about to enjoy a dozen free calendars for April that are all free for printing. These calendars come in various themes! There are floral calendars, minimalist calendars and even cute and colorful calendars for the kids! A shoutout to Design Cuts and Creative Market for some of the design elements I used here! Now let me give you a quick rundown to some of the designs. Looking for an ultra feminine April calendar? Snag this one for free! Look at those charming hand-painted flowers in purple. They’re gorgeous, isn’t it? Print yours today and use it to organize your schedule at home and work. It’s the perfect calendar to use to embrace the beautiful spring season! The next calendar that I have here has been one of the readers’ favorite designs since last year. I love how the dark background contrasted boldly with the delicate florals. I think this is going to be the calendar that I’ll be using to organize my blog posts for the month. How about you? Where are you going to use it? In the mood for a floral calendar but you want it minimal and simple? 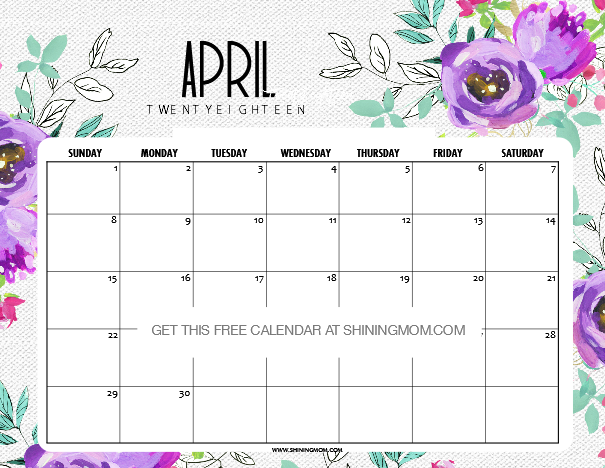 You might like to print this dainty calendar that I have for you! This April 2018 Calendar is great to use to use as a meal planner and more! And oh, it’s less on ink, too! Print this for your home and office! The next calendar that I am showing you is a must-print! If you’re looking for a calendar that will keep you inspired to stay organized month-long, this can be the right one for you. Look at those charming blooms, they look oh so refreshing, they will inspire you to have a blissful day, everyday! Moms and ladies, this is for you! That’s it for the quick preview of our floral and minimalist calendars. You’ll actually find more designs in your download! Meanwhile, let’s check out the cute and colorful calendar designs for the kids! If you have little ones, be sure to print calendar planners for them ,too. Teach them to get organized early! 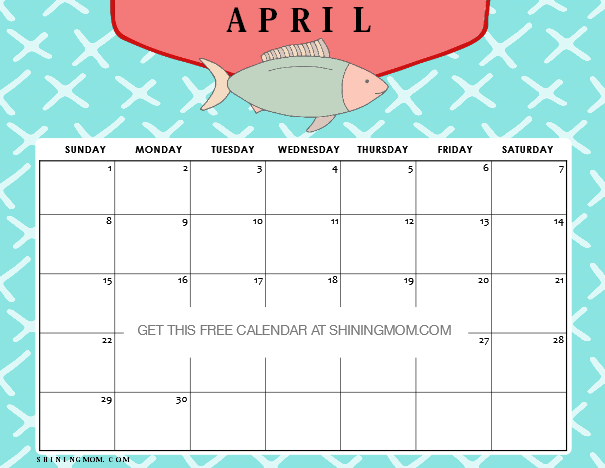 Cute Free Printable April 2018 Calendars for Kids! Calling all parents, grandparents and teachers! 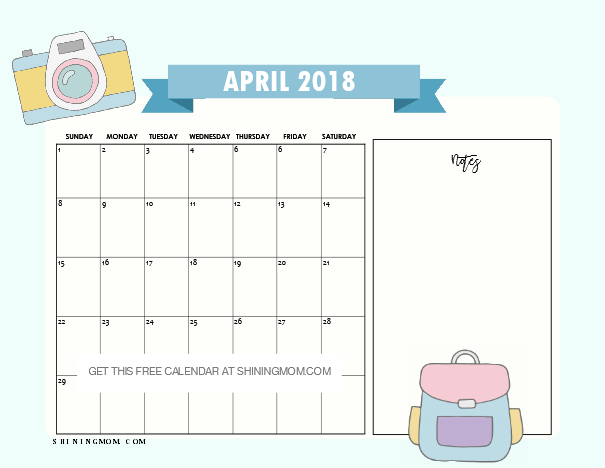 The next free printable April 2018 calendar planners that I have here are designed for the little ones! Moms and dads, print copies to insert in your kids’ school binder and teachers, print copies to post in your class bulletin boards! These calendars are fun to use that kids will definitely enjoy! Your kids love nautical prints? Snag a copy of this calendar for them! This one looks playful and fun. They can use it to organize their homework schedule. It’s also great to use as a planner to keep track of their activities in school! The next calendar is another cute number designed for the school kids! It also holds a special room for the kids reminders in school! Choose which calendar designs to use. Feel free to print more than one for as long as it’s for personal use! Plan out your month using the calendars! Loving this April 2018 Calendar Set? You’ll Love the “Back to Basics Binder”, Too. Spread the Planner Love. Pin this Post on Pinterest! Friends, share our love for organizing. Please take a second to pin this post on Pinterest so others can find the blog, too! If you have no time to print the calendars yet today, you can also save this post for later that way! Thanks! Lastly, what’s your favorite design from this set. Please let me know at the Comments. I’d love to hear from you. Have a blooming April, friends! May these free planners help you and bless you! « February 2018 Calendar: 6 Free Beautiful Designs! The link when I go to sign up to have the April calendars emailed to me isn’t working. Hi! Please check again. The links are working properly at my end. Thanks! You’re most welcome, Yonna! Please enjoy your visit here. Hope you’ll come back for more organizers!